I’ve just listened to the audiobook version of 4:50 from Paddington (originally published in the United States as: What Mrs McGillicuddy Saw) and let me tell you, it was brilliant! 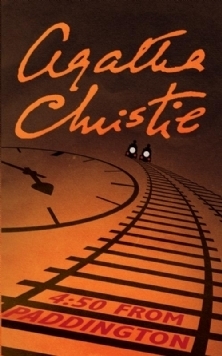 The pace of the story was just right (classic Agatha Christie) and the conclusion of the mystery was completely unexpected! Even though the book was written and published in the 1950s it’s still a relevant story, and 21st century readers can easily relate to. The whole story was very cleverly written, with a few twists to get the reader (or in this case, the listener) thinking and trying to figure out “who dunnit”. PLUS, you get to go on a train ride through the English countryside! What more could you ask for in a book? This story was so intriguing and exciting, I can’t wait to read/listen to my next Agatha Christie classic! Oh you should definitely read at least one of her books! You won’t regret it! Hurray! I love it when my reviews make it onto people’s TBR list! I agree. I love Agatha Christie!